One Last Tour was a worldwide farewell tour by Swedish electronic dance trio Swedish House Mafia following the announcement of their break-up in June 2012. The tour took place through November 2012 to March 2013. On September 24, 2012, Swedish House Mafia announced the dates for their farewell tour appropriately named "One Last Tour". The tour kicked off in November 2012 and concluded in March 2013. 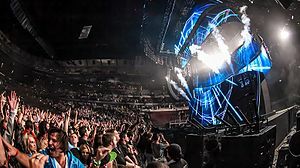 Due to extremely high demand, additional shows were added, and the group made their final appearance at the Ultra Music Festival with an opening and closing set on March 15 and March 24, 2013, respectively. A note was written and shown at the end of their final performance, with an acapella performance of their final single "Don't You Worry Child". This page was last edited on 3 June 2018, at 12:48 (UTC).